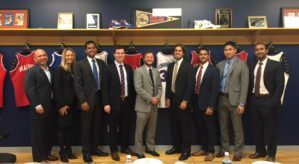 The Wharton Sports Business Initiative examines the sports industry in the same manner that, for example, financial institutions, manufacturing or the real estate industries are traditionally explored at major business schools. Wharton is uniquely positioned with its breadth of faculty to serve as a leader for the examination and implementation of best practices and future business models in this arena. Many sports industry practices may be ‘suboptimal’ – that is, there may be inefficiencies that could be eliminated or reduced if the industry were exposed more broadly to new ideas from the academy. The academic setting allows for sports business competitors to benchmark and work together on industry wide issues. Additionally, the Initiative is focusing on best practices for sports entities and individuals regarding their philanthropic activities. The Initiative is located in the Wharton School’s Legal Studies and Business Ethics Department. WSBI provides opportunities at its main campus in Philadelphia as well as at Wharton | San Francisco.